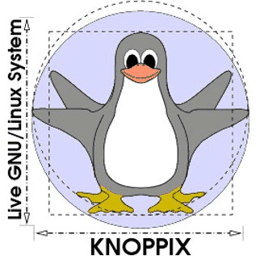 KNOPPIX is a bootable Live system on CD, DVD or USB flash drives. It consists of a representative collection of GNU/Linux software, automatic hardware detection. Also it support for many graphics cards, sound cards, SCSI and USB devices and other peripherals. KNOPPIX automatically detects and supports a wide range of graphics adapters, sound cards, USB devices and other peripheral devices. It is not necessary to install anything on fixed disk. Because of its transparent decompression, up to 2 gigabyes of executable software can be present on a CD, and up to 10GB on a single-layered DVD. Because of its transparent decompression, up to 2 gigabyes of executable software can be present on a CD, and up to 10 GB on a single-layered DVD. A.D.R.I.A.N.E. (Audio Desktop Reference Implementation And Networking Environment) is a talking menu system, which is supposed to make work and internet access easier for computer beginners, even if they have no sight contact to the computers monitor. A graphical environment with also talking programs and arbitrary magnification using compiz-fusion, is another option. Depending on your choice of CD or DVD, a variety of software packages from the Debian software repositories (www.debian.org) is installed. In the USB flash disk variant, it is possible to store your own settings and additionally installed software permanently via “overlay”, so that the system behaves just like a “real harddisk” installation. New: For computers that cannot start directly from USB, there is a “boot only” CD-variant available, which can be used together with a previously created Knoppix USB flash drive. Using this boot CD, the system starts from CD drive first, and then switches and continues to run on the USB flash drive.